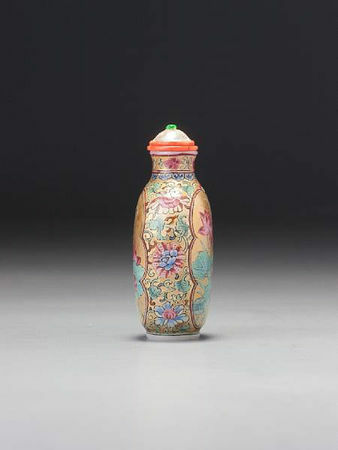 HONG KONG.- Bonhams Hong Kong today (23 November 2010) celebrated its second “Golden Gavel Auction”, when Part II of the world’s finest collection of important Chinese snuff bottles, the Mary and George Bloch Collection, sold 100% and achieved world record prices. Against presale estimates of HK$24,000,000, the sale total was HK$54,832,000 (£4, 437,930) with every one of the 155 rare bottles successfully sold. 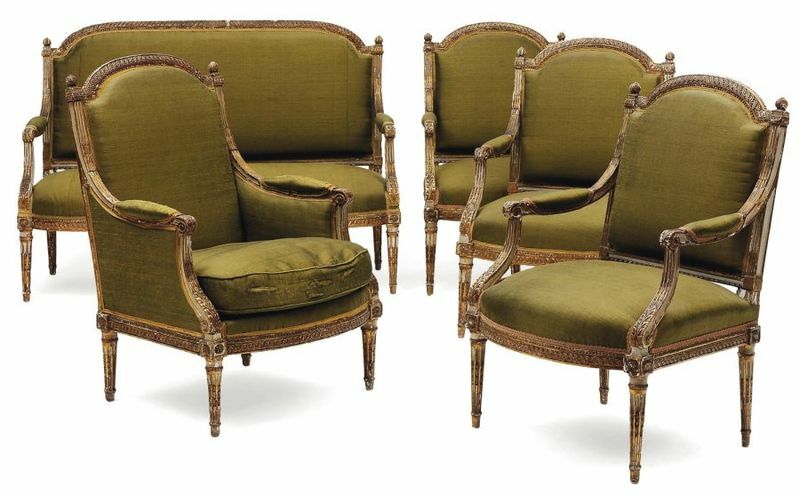 A good number of the lots sold for twice to four times its estimate. 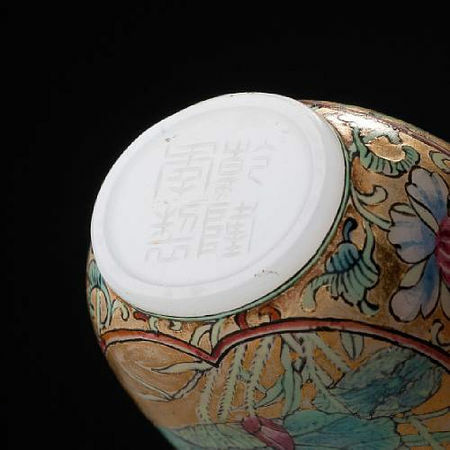 A new world record for a porcelain snuff bottle was reached when Lot 121 sold for a staggering HK$8,384,000 (£678,815), four times its pre-sale estimate of HK$2,000,000. Commissioned by the Qianlong emperor and enamelled in the palace workshops of the Imperial Palace between 1736 and 1760, this extraordinary snuff bottle, decorated with ‘double-gourds’, symbolic of long life, is identical to another rare example still preserved in the Forbidden City Palace Museum. Condition: very minor natural pitting of some enamels used as part of the design on the gourds, where the pits have been edged in some places with dabs of red enamel to look like variations in the rind of the fruit; not at all obtrusive, even where not used; otherwise, in extraordinary, kiln condition and apparently barely, if ever, used. Commentary: This is one of a well-known group of almost identical bottles, presumably made as one or more sets in series. Others are in the J & J Collection, Moss, Graham, and Tsang 1993, no. 231 (the duplication prompted the disposal of the present bottle some years ago); Lady David 1973, no. 836; JICSBS, Summer 1988, inside cover; Geng and Zhao, no. 122 (also appearing in China Guardian, Beijing, 1 June 1967, lot 1173, and again in Hanhai, Beijing, 5 July 1999, lot 1603); Li Jiufang 2002, no. 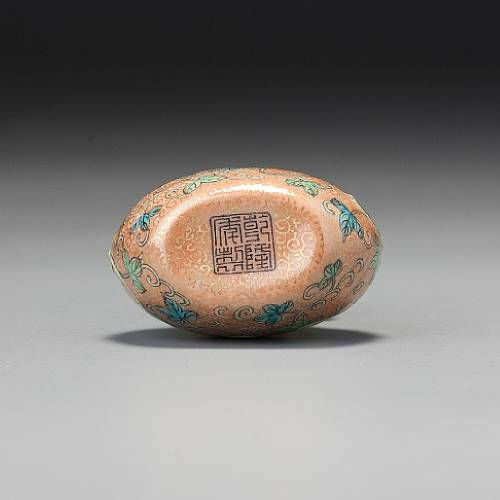 311 (which is also in Zhu and Xia 1988, plate 51; from the imperial collection), and Christie's, New York, 2 December 1993, lot 466 (also in Lam 2003, p. 13, fig. 15; from the Denis Low Collection). This bottle is moulded in two parts that are joined vertically, the joint visible on the inside but not on the outside. It shares with the Tang Ying bottles the thinness and delicacy of the porcelain body; it has a similar seal mark in black enamel and a very similar tiny floral scroll in gold on a coloured ground. 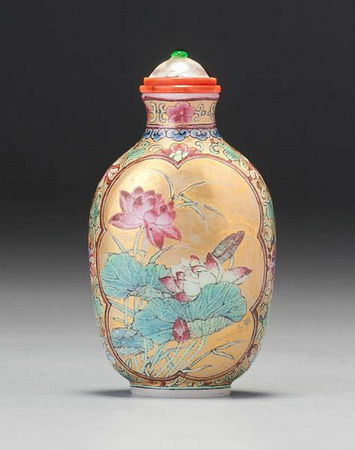 The quality is also exceptional, both in the painting of the design and the firing of the enamels. We are probably safe in assuming that it was made during the earlier part of the reign, perhaps as early as the 1740s. It is not at all out of place among the high-quality wares made under the supervision of Tang Ying, and now that we have proof of high-quality early-Qianlong porcelain snuff-bottle production at Jingdezhen, there is no reason to believe that this was not part of it. 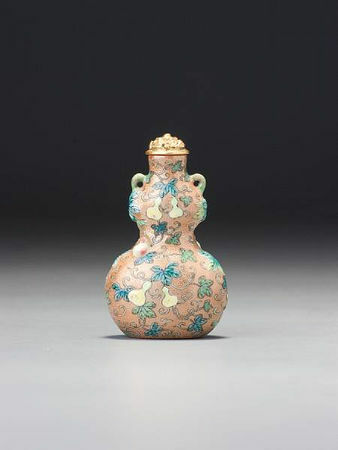 All of the early-Qianlong bottles made at Jingdezhen under the supervision of Tang Ying or benefiting from the high level of artistic and technical quality he brought to the kilns are masterly; this is no exception. Apart from the thinness of the body and the delicate formal balance between the upper and lower bulbs of the form, the composition is extremely well thought out. The painting is exquisite, just as it was on the J & J bottle, where we noted the elegance of the brushwork, particularly in the painting of the leaves with their well-controlled, beautifully modulated black lines on green enamel. It may be fruitful to link this small series of early-Qianlong masterpieces to a certain order from the emperor in 1758 (twelfth month) for 'nine gourd-shaped snuff bottles' to be made at Jingdezhen based upon one of three samples sent down from the court. 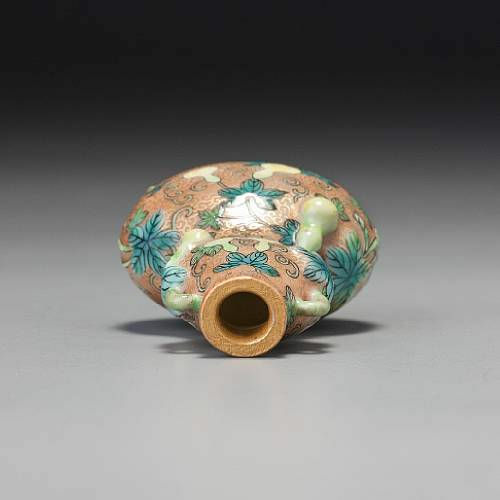 The samples in the imperial order are described as yangci ('foreign porcelain'); despite the ambiguity as to the precise meaning of this term in the mid-eighteenth century, it seems likely that the three samples sent down to Jingdezhen were porcelain rather than enamelled metal. 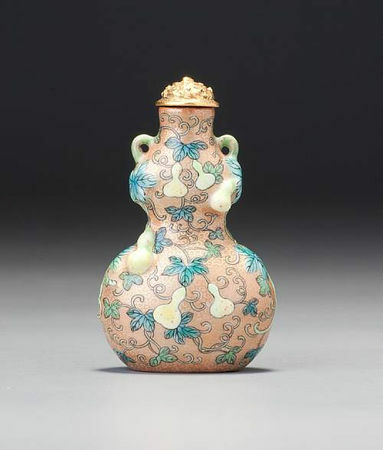 From this order, we can therefore posit the existence of two series of such bottles, the later series known to have been limited to nine pieces; if the two series constituted the total production, half a dozen is a plausible number to have survived. Linking the surviving bottles to the 1758 order also explains why the relief gourds appear to be in different positions on some bottles: each series was made with its own mould, resulting in minor changes to the positioning of the relief elements. The highest price of the sale, and a new world record for a glass snuff bottle was achieved by Lot 152, a 'famille-rose' enamelled gold-ground glass 'lotus' snuff bottle, which sold for HK$9,056,000 (£732,921), almost four times its presale estimate of HK$2,500,000. This exquisite snuff bottle was commissioned by the Qianlong emperor (1736-95), and decorated with lotus flowers against a rich golden ground, and incised on the base with the Imperial mark. Commentary: The painting on the present bottle is not only purely Chinese in conception and style, it is magnificently well painted, with all the subtlety of the finest enamels from the early-Qianlong palace workshops. In an unusual reversal of the usual technical shortcomings on early enamels on glass, the green here has fired exceptionally well, while the ruby-pink, where it is thicker, bubbled in the firing and is pitted where the bubbles burst. The excellent state of the gold ground on so many bottles of this group suggests they have barely been used. 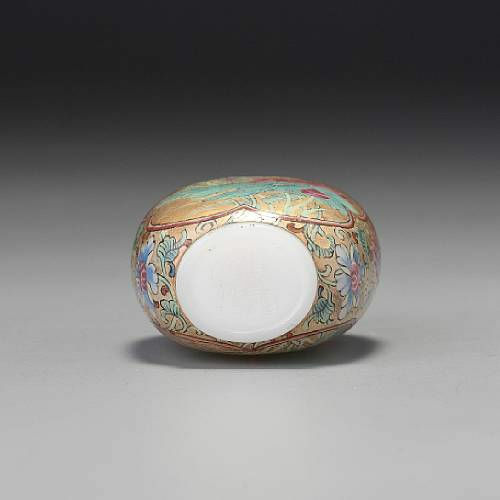 Enamelled glass was not distributed with the same largesse as more easily produced wares, so far more remained in the imperial collection until after 1860 and were less exposed to wear. The stopper for this bottle was made by Moss with a pearl provided by Bloch. Among the many bottles in the National Palace Museum, Taipei, the vast majority have what appears to be an enamelled metal stopper imitating a lapis cabochon with a pearl finial and a gilt metal collar, while others have the standard gilt-bronze stopper for palace enamels, with a formalized floral design. 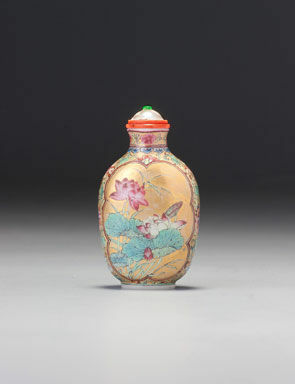 Part III of the Snuff Bottles from the Mary and George Bloch Collection will take centre stage at the Bonhams Spring 2011 Auctions to be held in May 2011. 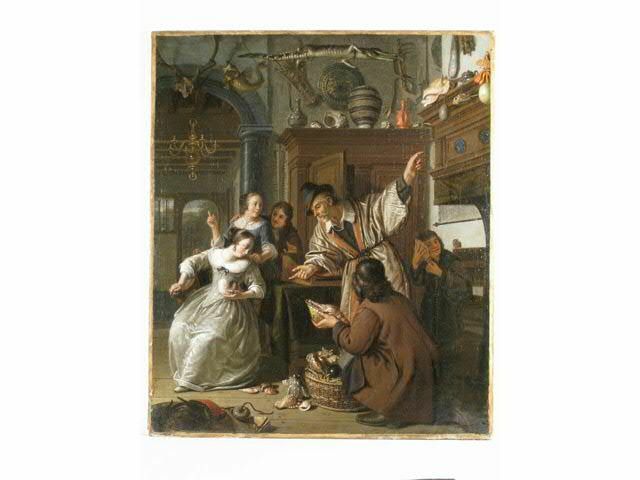 JAN JOSEPH HOREMANS II, "CABINET DE CURIOSITÉ". A chinese export famille-rose 'lotus' punch bowl. 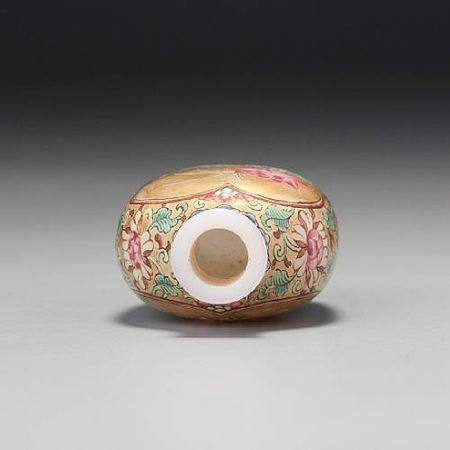 qing dynasty, circa 1765.